Orthodox Jews who believe in the true Torah have always opposed Zionism in any form, and disassociate themselves from all actions of the Zionist State calling itself Israel. But in the wake of the Zionist action in Gaza, even many non-religious Jews have begun to see that Zionism is wrong. The following item appeared in the news. We wish to stress that the views expressed below do not necessarily reflect the views of True Torah Jews Against Zionism. Early on Thursday morning, January 15, Jewish activists in a historic first in Los Angeles, chained themselves to the entrance of the Israeli Consulate and blocked the driveway to the parking structure, blocking all traffic in and out of the building. "We sent a clear message to the world that LA Jews are part of the global majority in opposition to the Israeli siege of Gaza," said Lenny Potash a 72-year old protester who was cuffed to eight other activists, blocking the driveway to the consulate. The activists were joined by 50 other supporters and who chanted "LA Jews say, End the Siege of Gaza" and "Not in Our Name! We will Not be Silent!" Protesters also held up signs reading "Israeli Consulate: Closed for War Crimes." siege and win justice for Palestinians," Ellis said. "We are shocked and outraged at Israeli's latest act of violent aggression against the Palestinian people. Killing over 950 people, including 250 women and children, bombing schools and mosques and then calling it self-defensethat is the worst kind of hypocrisy. 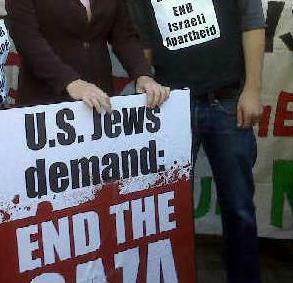 It also amounts to war crimes," said Hannah Howard, a local member of the International Jewish Anti-Zionist Network. "We shut down the Israeli consulate today because as Jewish people we cannot allow business as usual while violence is being done in our name." Action participants also spoke out against the US government's unconditional support for Israel's siege and its ongoing war against the Palestinian people. "While US-funded F16's rain down bombs on the people of Gaza, our elected officials locally and nationally offer unqualified support." said Marsha Steinberg, a retired union representative. "Our government must stop sending billions of dollars in military and economic aid to the Israeli war machine," Goldberg said. In the coming week, concerned Americans from all backgrounds will call on the new presidential administration to make a 180 degree change in policy. "While the end of the siege on Gaza is our most immediate priority, this is only the latest chapter in Palestinians' 60 plus year experience of occupation and ethnic cleansing. Peace and justice in the region will only come when Palestinians have freedom and control their own destiny," said Lisa Adler, a community organizer in Los Angeles and another member of the International Jewish Anti-Zionist Network. "Even before the siege began, Israel's inhumane months-long blockade of Gaza created a major humanitarian crisis. We must end the siege. And we are building a nonviolent international movement of boycott, divestment and sanctions that brings an end to Israel's policies of occupation and apartheid and advances the Palestinian struggle for justice," said Adler. The event in Los Angeles was inspired by a similar act on January 7 in Toronto, Canada, when a diverse group of Jewish Canadian women occupied the Israeli consulate at 180 Bloor Street West. They stayed until they were forcibly removed by the Canadian police.